Egypt tried to draw a line under a deep economic crisis Thursday by allowing its currency to float freely. 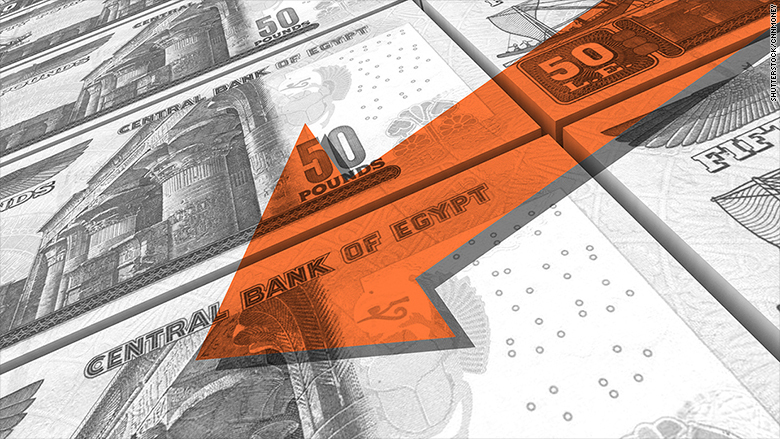 The move saw the Egyptian pound crash 48% against the U.S. dollar, but should mean the country can now access a huge bailout from the International Monetary Fund. "The flexible exchange rate regime... will improve Egypt's external competitiveness, support exports and tourism and attract foreign investment," IMF Mission Chief for Egypt, Chris Jarvis, said in a statement. "All of this will help foster growth, job creation and stronger external position for the country." Egypt's central bank said the decision to float the currency was taken "to quell any distortions in the domestic foreign currency market... and allow market demand and supply dynamics to work effectively." According to central bank data, one U.S. dollar now buys 13 Egyptian pounds, compared to 8.8 on Wednesday. "This is a positive step to stop the disruption in the currency market," said Mohamed Abu Basha, economist at EFG Hermes in Cairo. "We now expect the black market activity to diminish." The Middle Eastern economy has slumped since the Arab Spring in 2011. Foreign investors have been reluctant to put money into Egypt. Terror attacks and aviation disasters have also paralyzed its vital tourism sector. And the IMF had indicated that a free-floating currency was key to securing a $12 billion emergency loan that was agreed in August. The government is pushing through a series of reforms to boost growth and help the poor. It wants to introduce a sales tax and slash electricity subsidies. It plans to spend the money from the IMF on health and social programs. Egypt's main stock market index got a boost from the news, rising 3.4% by the end of the trading day.